If statistics are taken into account, nose piercing ranks second in the list of most common body piercing types. The tag of most common piercing type of course remains with ear piercing. Nose piercing might or might not involve piercing of the skin or cartilage of our nose. So, the pain caused by the process tends to vary depending on the method of piercing adopted by the expert. Nose piercings can be done on various parts of the nose; there are certain types that are extremely simple, while there are others than involve several complex steps. 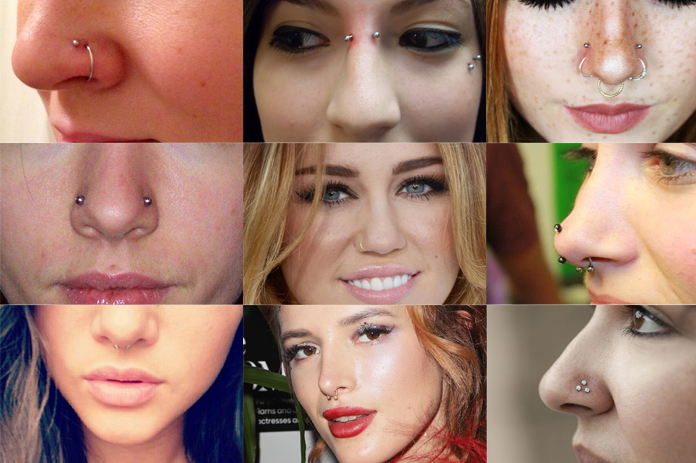 Read on to know about nine of the most popular variations of nose piercing. 1.9.1 Was this article helpful? This one is surely one of the most widely tried nose piercing type and happens to be a common practice in Nepalese and Indian culture. Women living in those parts of the world believe that having the left nostril pierced would help them in easing pain during pregnancy and menstruation. With a nostril piercing, you will need to place the jewelry on the crease of the natural curve of your nostril. 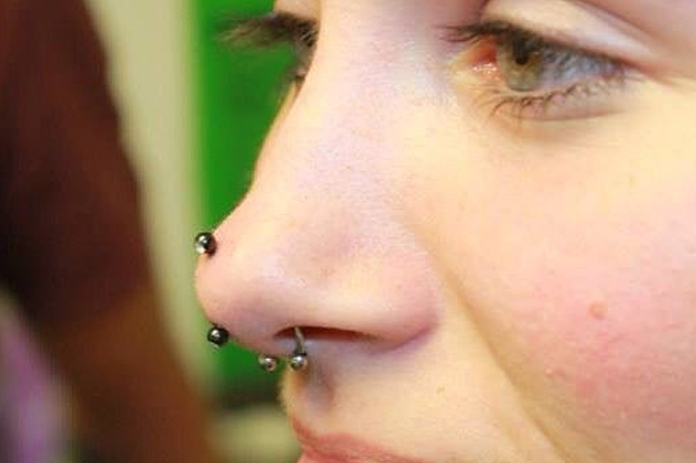 As its name suggests, it’s a variant of the standard nostril piercing. It would involve creation of two holes on the topmost crease of your nostril; the second hole is created higher than the first one. 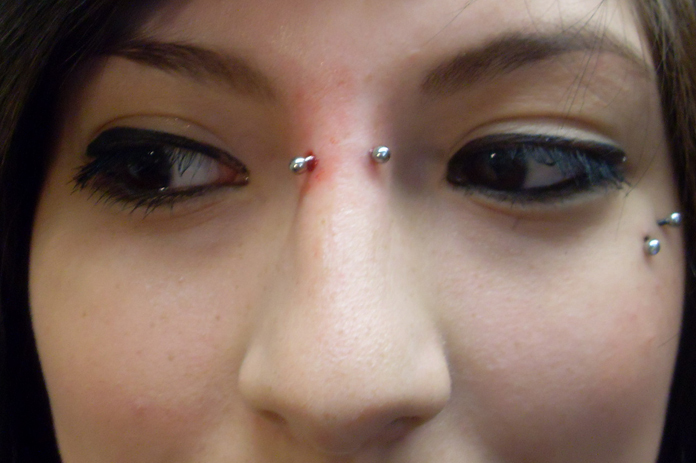 Double nostril piercing is perceived to be a much bolder and more adventurous version of the regular nostril piercing. To justify your decision of having this form of piercing, you must pick your jewelry intelligently. 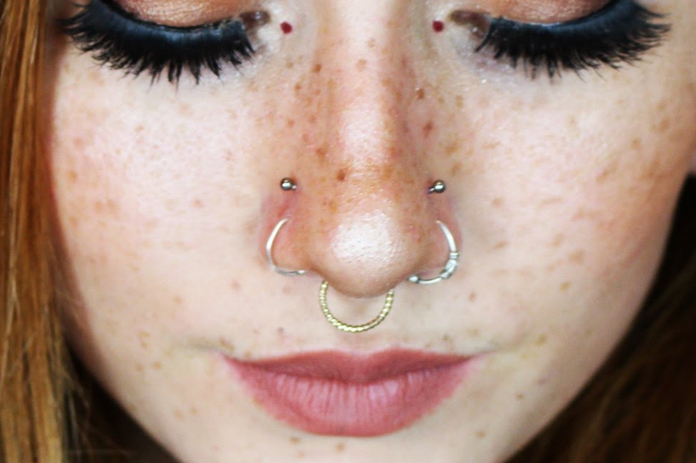 The kinds that would complement a double nostril piercing best include nose hoops, I-shaped pins, nose bones or studs, nostril screws, captive bid nose rings, and circular barbells. As you will have a couple of holes on your nostril, placing the jewelry would be a job best left to a professional piercer. Only an experienced and qualified piercer would be able to complete the job without hitting any nerve structure. 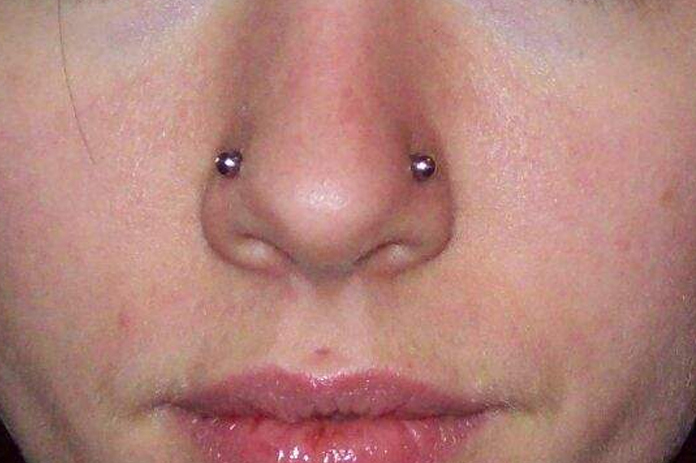 This is the third variant of standard nostril piercing. The piercer needs to have greater precautions when carrying out this type of piercing. Here also it’s mandatory that you get the job of placing the initial stud or nose pin by a professional piercer. A triple nose piercing would require you to wear three pieces of jewelry. The holes in this form of piercing are usually arranged in triangular pattern. For maximum comfort, we would advise you to wear studs on your triple nostril piercing. 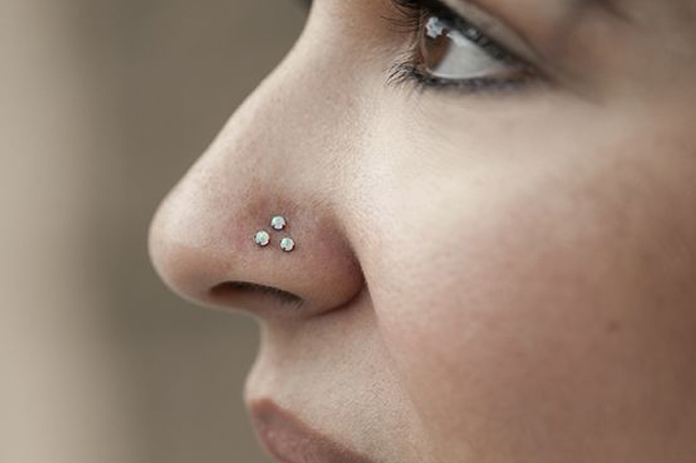 As the name of this piercing type suggests, it involves creation of a hole, 0.5 or 1 cm above the nostril’s natural curve. To look best with your high nostril piercing, you should limit your jewelry choices to I-shaped nose pins, nostril screws, and studs. As far as popularity among people associated with the fashion industry is concerned, septum piercing seems to outscore the majority of the piercing types discussed on this page. This type of piercing is done on the nostril’s cartilage division. However, as we have pointed out at the beginning of the article, the hole is not necessarily created on the nose’s cartilage. Instead, it is placed exactly on the area of the nose that doesn’t have any cartilage. Earl or bridge piercing is done on the nose bridge. To enhance the piercing, you should either wear a circular barbell or opt for a curved barbell. Due to the location of the piercing, many believe that it might end up damaging our cartilage and bone. However, in reality, it doesn’t cause any sort of harm to us. With a bridge piercing on your nose, you will have to place the jewelry along your nose bridge’s surface. Due to this reason, this piercing type might result in migration forcing your body to reject the jewelry. Rhino piercing is done vertically on the nose tip. When you will wear your jewelry on the piercing, its tip would be visible both under and above your nose tip. The only kind of jewelry you will be able to wear on a rhino piercing is curved barbell. It involves creation of holes both on the septum and the nostril. The only jewelry type you will be able to wear on a nasallang piercing is straight barbell. This is possibly the most complicated piercing type we know about. What’s most crucial is that other than being complex, the procedure is also pretty painful. Another major problem with septril piercing is stubborn nose piercing scar that refuses to go. The piercing is done on the septum and the nose tip (half vertically). The piercer would first assess your septal cartilage and bone structure and then decide whether you are eligible for a septril piercing. Common jewelries used by women with this piercing type include nose bones or studs, curved barbells, and eyelets. We have discussed about various nose piercing types. Now, it’s your turn to choose the one that would match your personality and face most aptly.